In November 2013, I experienced Anna Kashina's wonderful Eastern European fairy tale Mistress of the Solsitice. It was a wonderful foray into the folklore of a different culture than I am used to from my childhood. Last month, I was presented the opportunity to go back into a folktale from another background; and by one of my favorite authors no less. After a very crazy April, I needed the escape to the land of make believe. What I got was impressive and immersive. This folktale comes to us from a Polish background. 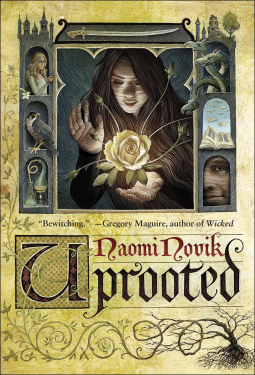 If you are unfamiliar with Naomi Novik, she writes a brilliant series about a Napoleanic era dragon named Temeraire. She is an author who can spin an amazing tapestry with her words that just shines brighter in this folktale setting. I am not sure from which fairy tale this story originated. I do know that I fell in love with this story. We are introduced to a small village on the very outskirts of a kingdom bordered by a man-eating forest. To keep the trees from stealing children and livestock, a wizard is stationed in an isolated tower and takes himself an apprentice every 10 years. Then, we are introduced to the girls he will choose from at the harvest ceremony. What we come away with at the end are lessons about expectations and perception. There is loyalty and bravery and magic; all the necessities of an excellent fairy tale. The pace moves smoothly through action, tension, and narrative. The whole picture is so intricately balanced. The characters and their development are inspiring. Agnieska's personal growth in particular has so many valuable lessons about coming terms with yourself and inner acceptance. And one of my all time favorite parts about this book: it is a story about love like few others are daring enough to do right now--not be in your face about it. The story is beautiful and romantic in a real way. This tale easily deserves 6 stars. It really just surpasses anything I have read in the last year and the re-read potential is unlimited. Go pre-order a copy today over at Naomi's website.